Elektra is a fictional superhero developed by Marvel comics. She is a Ninja assassin wielding a pair of bladed Sai. Elektra is the crush of another superhero, Daredevil, but her violent nature and assassin lifestyle has separated the two for years. 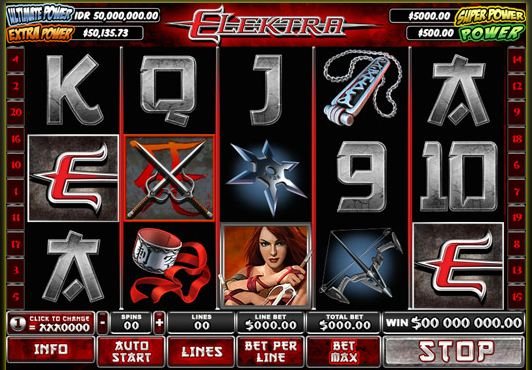 Elektra has been brought to an online casino near you by Playtech. It is one among the Marvel slots developed by Playtech. The symbols in use in this online slot have been borrowed from the original comic. The picture of Elektra herself plays wild and can replace any other symbol except the Elektra Logo, which is the scatter symbol. Her assortment of weapons also features on the reels with the most conspicuous one being her favorite Sai swords. Other weapons that form the icons in Elektra slots are Shuriken, the star-shaped killer discs and the Bow with an arrow. The slot also features some of jewellery like Arm Band and the mysterious Pendant. The Pendant was given to her by her mother on her dying bed, and I believe it has super-powers. The slot also uses High Value themed cards; 9, 10, J, K, Q and A styled to reflect Japanese martial arts. Many of these animations showcase impressive animations with the weapons symbols standing out. For instance, the bow symbol releases a red hot arrow while the Shuriken rotates at incredibly high speeds. The wild symbol Elektra does a Sai slash followed by a glowing, “WILD”. I love the fact that there’s no background music during the game; I am not boring. However, the free spin feature has exciting background tones that add to the thrill. Elektra slot is a five-reel 20 pay lines slot game with massive payouts. Players can wager as little as 10 coins per line and a maximum of 200 coins per spin. The total bet price will depend on the coin size you choose. Players have a variety of eight coin sizes to choose from – 0.01-5.00. Elektra herself is a wild symbol. Elektra appears only on the 2nd, 3rd and 4th reels. You can substitute the Elektra symbol with all other symbols except the Elektra logo. Unlike other wilds in other games, the Elektra symbol doesn’t offer multiplier or cash rewards. The scatter symbol in Elektra is The Elektra Logo. When you land two or more Elektra symbols at any point on the reels, you are up for significant payments. When you bag three or more of the Elektra logos, you activate the Weapon Bonus Round. In this bonus round, the players are given a chance to choose one amongst the three weapons that are used by Elektra. Different weapons reward different numbers of free spins. For example, when you choose the crossed out Sais, you get ten free spins; the deadly Shuriken rewards fourteen free spins with 2x multipliers. The blazing bow offers seven free spins and 4x payouts. Elektra is a Marvel slot and like you would expect it is part of the four-level Marvel Mystery progressive jackpot. The jackpot is connected to all Marvel slots thus increasing the value of the Jackpot. The jackpot is triggered manually, but you have a better chance at activating the jackpot if you wager more.